More and more computers will become web-cam enabled in the coming years. Eyejot hereby gives a platform for you to send any private videos easily through the internet. (1). Email messages can be confusing, express messages in video to send via e-mail. (2). Video chatting is cool, *if* everyone is online, as technology and internet access improves, everyone is using video chat. (3). No one likes installing applications; no software need to be installed for this application. Eyejot is an online video messaging platform that can be used for both business and personal communications. The service is free without the need of any software to download or install on your computer. Just register an account, login to your account, after that you can record or upload your video and send it to your friends and families or business partners. The recipient will be notified by e-mail that there is a new video message. To watch, all they have to do is click on the link you have sent. 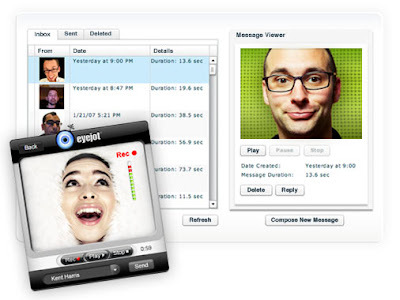 Eyejot offers everyone the ability to create and receive video messages in an independent and free spam environment.